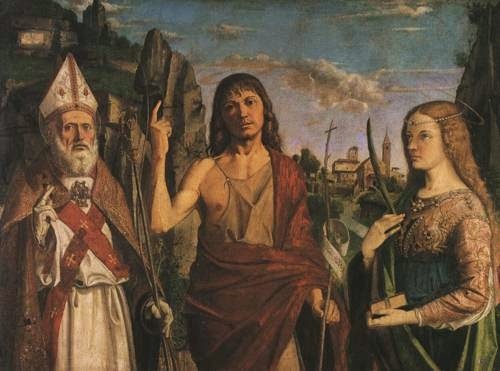 Entered in the Roman Martyrology on 12 April as a Bishop of Verona martyred under Gallienus. Probably, however, he was a confessor who governed the Church of Verona from 362-380. At Verona a basilica, San Zenone, is dedicated to his honour, and some thirty churches and chapels bear his name. In the basilica his statue, bearing the episcopal insignia, is prominent in the choir; coins with his likeness and an inscription were in use. On 21 May and 6 Dec. the translation of his body and his consecration were formerly commemorated. In "De viris illust." Of St. Jerome and Gennadius, Zeno is not mentioned, but St. Ambrose (Ep. v) speaks of him as an episcopus sanctae memoriae, and St. Gregory (Dial., III, 19) relates a miracle wrought at the Church of St. Zeno at Verona. Mabillon ("Vetera analecta", Paris, 1675) published an anonymous poem, "De landibus Veronae", taken from the writing of Ratherius, Bishop of Verona (d. 974), found in the abbey at Lobbes in Belgium (P.L., XI, 154, 225), which gives a list of the bishops of Verona and makes Zeno eighth. In the Monastery di Classe at Ravenna was found an eighth-century chasuble (casula diptycha) with the names and pictures of thirty-five bishops of Verona on its front and back; among them was that of Zeno. This list was accepted by Gams in his "Series episcoporum" (Bigelmair, p. 27). Zeno had not been known as a writer before 1508, when two Dominicans, Albertus Castellanus and Jacobus de Leuco, edited at Venice 105 tractatus or sermons found in the episcopal library of Verona fifty years earlier. In 1739 the brothers Ballerini published "S. Zenonis episcopi Veronae sermones", with an elaborate prolegomena. From these it appears that Zeno was a native of Africa, eighth Bishop of Verona (362-80), an able speaker, and an untiring champion of Christianity against the heathens and of orthodoxy against the Arians. Much controversy arose as to the time at which St. Zeno lives, whether two bishops of Verona of this name were to be admitted or but one, and on the authorship of the sermons. Various opinions were held by Sixtus of Siena, Baronius, Ughelli, Dupin, Tillemont, Fabricius, and others. Of the 105 sermons 12 have been rejected as belonging to other authors. Of the rest 16 are larger sermons, the others merely sketches or perhaps fragments. They contain valuable material on Catholic doctrine, practice, and liturgy; they treat of God, creation, the Blessed Virgin, Holy Scriptures, the Church, the sacraments, etc., and warn against the vices of the day.